The Santo Domingo Jesuit church was built on the site of the Incan Sun Temple, the Coricancha, in 1534 after Francisco Pizarro and the conquistadors had taken the Incan capital of Cuzco, Peru. I was very captivated by this crucifix, sculpted from wood and painted, hanging ‘between worlds.’ The stone beneath is the finely cut masonry of the Incans from the original Sun Temple, and the upper part, built by the Spanish after the conquest, contains a floral motif painted by Incan artisans they employed. 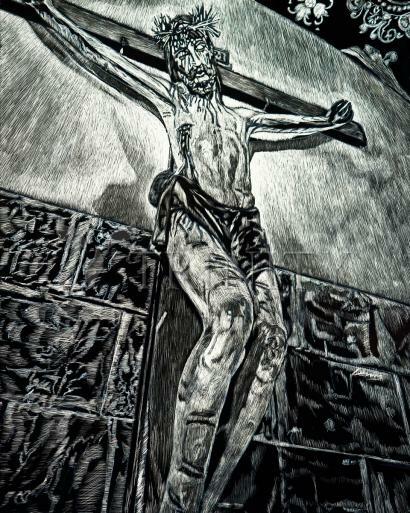 My version, in black and white, was done on scratchboard, inspired during the Lenten season, 2015. It is my hope that it will inspire you to be mindful of Christ’s Passion and the mercy we find here. When Spanish colonial forces were conquering Peru, the city of Cuzco was one of the strongholds of power for the Inca Empire, and was fiercely defended and contested, changing hands twice before the Incas were finally repelled in the Siege of Cuzco in 1536. For such a vital location, it is not surprising that the leading Catholic Church in the most important colonial city in the region was built with care and attention to detail, taking over a century to complete. Today the Cathedral is one of the most important and popular tourist sites in Cuzco both for its role in the history of the city and for its beautiful architecture. When the Spanish conquistadors arrived in Cuzco, the most important and prominent temple in the city was Qorikancha, a temple dedicated to the sun god Inti and one that many historians believe to have been the holiest in the Inca Empire at the time. The Spanish chose this as the best site for their new cathedral, and used many of the foundations of Qorikancha to build the cathedral itself. Today visitors can still see a small number of the ruined walls of the temple to the rear of the Cathedral, although the reports of the true magnificence of the temple cannot really be confirmed by the small but well built walls that remain. A small church known as the Church of the Triumph was built in 1536, shortly after the city was conquered, but once Spanish power had been consolidated in the city plans began to build a much grander and more impressive Cathedral for Cuzco. The plans were drawn by the Spanish architect Juan Miguel de Veramendi, using the traditional cross-shaped design for the Cathedral. The Cathedral was built in a Gothic-Renaissance style that was typical of Spanish churches and cathedrals at the time, although there are some signs of Inca religious symbolism in the building, including the carved head of a jaguar which is a part of the main door of the cathedral. Construction of the cathedral began in 1559, and in order to save time when it came to quarrying and shaping stones, the Inca site of Sacsayhuaman, which lies on the hill above the city was used as a source of stones. The majority Inca population of the city was often used to carry out the brunt of the work during the construction process, as there was still only a minority of Spanish people living within the city. Over the centuries the Cathedral has become home to several important Catholic artifacts, including the famous Black Christ statue which darkened following the use of candles over several centuries, and is said to have helped the Church survive a large earthquake in 1650. There is also the large Maria Angola Bell, which is over two meters in height, and can be heard over twenty miles away when it is rung, although this only happens on special occasions now in order to preserve the bell. The Cathedral also has an impressive collection of art covering several centuries of work in Cuzco, including an impressive picture of the 1650 earthquake which is the oldest surviving painting in the city. As Inca artists were not allowed to sign their work, many of the spectacular paintings in the Cathedral are unknown in terms of the artist, but are nonetheless still very impressive. Visitors to Cuzco will usually include the Cathedral of Santo Domingo in the itinerary of any trip around Cuzco, both for its impressive facade and interior, as well as for the impressive location above a large open area below the walls of Qurikancha. Along with the Church of the Company of Christ which was built by the Jesuits in 1571 on the nearby Plaza de Armas, the Cathedral is one of the most important colonial buildings in the country. It is also still a vital part of the Catholic Church's influence in Cuzco, as it is the mother church in the city.